Some people are loyal to Starbucks, others to Peet's, and some who refuse to support the chains and only go to their local coffee shops. Well, I go to both of the chains and support some of my local places as well, but every Thursday afternoon I go to Peet's. 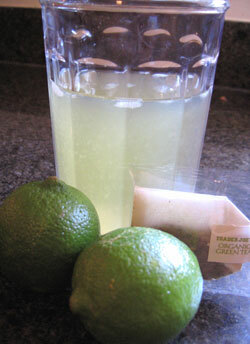 One hot afternoon last summer I discovered Peet's Jasmine Lime Tea Cooler. It was the highlight of every Thursday afternoon from that point on. When summer turned to fall, and fall was almost winter, I ordered my thirst-quenching drink, but they no longer had it! I was momentarily distraught. Starbucks alway had their Iced Green Tea Lemonade, so why shouldn't I be able to enjoy my Jasmine Lime Tea Cooler year round as well? I understand that it is a seasonal beverage, but personally I think it should be on the menu at all times! Last Thursday I was delighted to see that my iced beverage of choice is back on the menu! I've been waiting rather impatiently for the return, but now I don't have to wait any longer. I had one today and it was exactly what I needed. Cool, refreshing, and absolutely perfect. While I will certainly enjoy this for as long as I can, I found a homemade recipe for those days when I don't feel like running out to get one or when they take it off of the menu again. Can't wait to try this out for myself! This recipe serves one, but is easily doubled. You can make a pitcher as well.